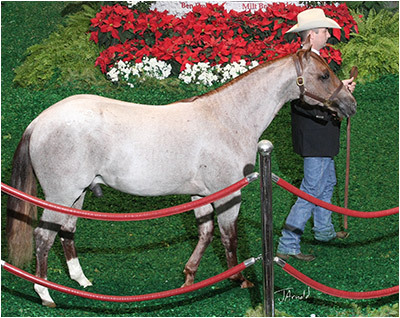 84 of Metallic Cat’s offspring went through the Western Bloodstock sales during the NCHA Futurity totaling $2,099,900. Top Preferred Breeders Sale: Metallic CD “Metallic Cat x Sweet Little CD” topped the sale bringing $110.000; Cowcat “Metallic Cat x Cowstruck” was the 3rd highest seller going selling for $95,000; Snow Me The Rey “ Metallic Cat x Nurse Moss” came in as the 4th highest seller, selling for $80,000; Ruby Shadow Cat “Metallic Cat x Ruby Tuesday DNA” was the 5th highest seller going for $77,000. 2 Year Old Sale: With only a select few 2 year olds in the sale, Liphys Black Cat, Metallic x Lipshy sold for $100,000; Metalic Al “Metallic Cat x Amandas Little Star” brought $90,000.